I just finished up N.T. Wright’s newest work, God and the Authority of Scripture: How to Read the Bible Today. I hope to soon post a book review, giving some overall thoughts on the book. 1) Christ is the true Israel. This is absolutely important in understanding the full sweep and grand narrative of God’s revelation in Scripture. I believe one of the more dangerous approaches to Scripture (though there are many) is that of reading the Old Testament Hebrew Scriptures as if Jesus, the Messiah, and the new covenant have not come. All Christians would claim to know and understand such. But too many people still read the Old Testament without the clarifying lens that Jesus and the new covenant have come. What I mean is that plenty of people have built a theological system looking to argue that we are still awaiting the fulfilment of the promises of God to Israel in the Old Testament. But it is Jesus, as Israel’s Messiah, who has come as the fulfilment of God’s promises and purposes and commands for Israel. Therefore, this is a paramount statement to recognise from the full story in Scripture: Israel is not the fulfilment of God’s purposes for Israel. Jesus, the Messiah, is the fulfilment of God’s purposes for Israel. It is Jesus and the establishing of the new covenant that brings forth the great goal of God in Israel, which are hinted at and foreshadowed in the Old Testament Hebrew Scriptures. We no longer await a Jewish return from exile-dispersion to a plot of land in the middle-east. Christ has fulfilled this. We no longer await a temple to be built in Jerusalem. Christ is the new temple of God and now he has sent his Spirit to dwell in that new temple being established as a new Jerusalem around the earth. We no longer look to establish any kind of sacerdotal priesthood and sacrifices. Christ is the high priest and sacrifice, or which now we are a priesthood and offer ourselves as living sacrifices. We must view the Old Testament – it’s story, it’s promises, it’s prophecies – as all being summed up in the life, death and resurrection of Israel’s Messiah. And now, all those in the Messiah, whether believing Jew or Gentile, are the new temple, the new priesthood, the new Jerusalem, the new Israel. And when the fulfilment comes, we are not called to hold on to that which pointed to the fulfilment. Rather we fully embrace and move forward in the fulfilment, which is Christ Jesus himself. 2) Fulfilment is not always tied to quoting a few verses, but rather fulfilling an entire story-account. There are no doubt times when we are to quote specific passages to back up a theological point we desire to make. The writers of the New Testament did this themselves when showing that Jesus, God’s Messiah, had come to fulfil Israel’s role and story. Read the early chapters of Matthew’s Gospel and you will see this. So this is a good thing, not a bad thing. But, it can be overdone and even miss the point of stepping back and viewing the larger picture of God’s redemptive and revelatory work described in Scripture. There is a bigger story going on within the Scripture than merely quoting a verse or two….or more. Yes, when considering how Jesus is the fulfilment of God’s promises and purposes through Israel, I do believe we can quote verses to show such. I do not deny such and when I teach topics of biblical theology, I do such. But the greater question is – What is the great narrative marching its way across Scripture and how do we understand this narrative being fulfilled? And so, Christ’s fulfilment of God’s purposes in and promises to Israel are not simply found by quoting a handful of verses. It is a realisation that, through engaging with the sweeping story of Scripture, we see that Christ is the great fulfilment of all God’s great redemptive plans and purposes for all peoples in all the earth. It began in Abraham, moved forward into the people of Israel, but with Christ being the great capstone of God’s project for the whole cosmos. These two points remain very important for me in understanding the grand story of Scripture: 1) Jesus, as Messiah, fulfils what Israel could not and cannot fulfil and 2) this fulfilment is not simply seen through quoting a few verses, but rather seeing the grand redemptive story of God accomplished ultimately in His Messiah. I believe that, as we remember these two points, it will help us grasp the overall story of God’s redemptive work as found in the full Scriptures of the Old and New Testaments. This entry was tagged Bible, books, Christ, Christ as Israel, Israel, Jesus, Messiah, N.T. Wright, quotes, Scripture. Bookmark the permalink. I think I may need to read that book sometime. Amen. Christ is the fulfillment of all. The living Word fulfills the written word. We try to make the written word fulfill or “prove” the living Word, when it really should be the other way around. Jesus IS the WORD. The scriptures are a picture of the preparation and inspiration that resulted in the living Word. I’m the poster formerly and also known as Rick C. But anyways…. I read Wright’s “The Last Word” a few years ago, which “Scripture and the Authority of God” is an update of. 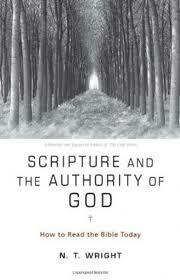 Probably THE best I’ve ever read about Bibliology (the doctrine of Scripture). I’ll have to check out NTW’s two new chapters. Highly recommended! what a great review! Wright has walked right up to fulfilled eschatology and shaken it’s hand! I wonder how long before he comes right out and addresses full preterist fulfillment [which everything he says here implies]? May the Lord continue to speak truth through you for all who have ears to hear!